Cold. Dark. Muddy. Miserable. "What in the HELL have I gotten myself into?" These were my first thoughts just minutes after exiting a helicopter with the Alpha 1/6, USMC. Tripping and stumbling in deeply furrowed farmland. Falling not once, but three times! "You are such a dork, Mary," I say to myself. "Wonderful first impression you are making here!" Later that day I was to learn that I was not the only "dork" in the dark. My colleague CNN correspondent Atia Abawi fell twice, and so did many of the Marines, even though they have night vision goggles. Above: Grabbing some rest at the 'Marjah Marriott.' Photo at top: This photo sums up Fiddler's Green to me. The Marines bring all the press corps assigned to cover Operation Moshtarak in early. Hurry up and wait. Looking around the press tent (a hack hotel), I recognize a few faces from other war zones I have covered for CNN in the past two decades. Same faces, different places. Most of these journalists are heavy hitters, long having earned their PhD's at the university of conflict coverage. A few are freshmen and women, including my colleague Atia, CNN's Kabul correspondent. She will be OK, I thought. All of us were warzone virgins once, and we are with some of the best-equipped, best-trained and most professional fighters in the world: the U.S. Marines. My main concern is which unit we will be attached to. I am praying it will be an armored unit. They have electrical power on those vehicles – a godsend to the press in the field. We would be able to get our video out. Power! Vehicles! It is here that we find out just exactly what our assignment on this embed will be. With a glint in his eye and a smile, the Marines' public affairs officer tells us, "You, CNN, will be with the Alpha Company on the main effort, an air assault into Marjah." We join up with the Alpha 1/6, the Marines we would be embedded with. We meet with Capt. Carl Havens, who to me resembles the actor Russell Crowe. He gives us an intensive briefing of what to expect on D-Day, if all goes down as planned. But nothing is ever certain in war. Capt. Havens modestly admits this is his first time on the "main effort" of an operation. First objective: to take the Loy Chareh bazaar. Second objective: to take the Marjah District Center. The Marines think it's a government building. It later turns out to be a ruined, battle scarred high school, built by USAID in the late 1950s. More hurry up and wait. I check with Havens for the umpteenth time about what time exactly CNN can go live with the information that the operation has begun. "At 2 a.m. local, when I am on the ground in Marjah," he tells me. I never did ask him if his were the first boots to hit the ground on this operation. Finally, time to board that chopper. We pass by the first casualty of the operation. A Marine lies on the ground with a twisted ankle. Not an auspicious start. Strange – I don't feel any pangs of fear or apprehension. 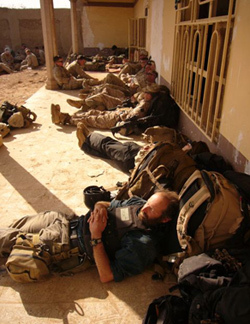 I have never had a deathwish, and usually in most warzones my guts are in knots. "Take calculated risks" has always been my motto. A few times I have even had an almost super psychic intuition that says: "Mary, stop and film from here and go no further!" So why no fear as I board the chopper? Perhaps I am too preoccupied with the practicalities, fixated on the all-important issue of power and how we get what we shoot to the network. Time is moving excruciatingly slowly. We move to a staging area for the push into Marjah. Casualties bog the Marines down. One Marine has asthma and is having trouble breathing, we hear over the crackle of radio traffic. He ends up getting hypothermia. Someone else has torn their ACL. We sit and wait until the Medivac choppers can come in. Can this night get any colder? Yes, it can. Atia, producer Gordon Duncan and I lay down on the wet, freezing ground and huddle for warmth. At some point she throws her leg over me. "You generate a lot of heat Mary," she tells me. Was she hallucinating? I was freezing! Then the call of nature comes. "Atia," I whisper, "I have got to pee!" "What about the Marines?" she asks. "They have night vision!" I so do not care. I crouch down in the largest furrow I can find ... whatever it takes. But finding relief in a dark, rutted field wearing a flak jacket is no easy task. The explosive ordinance disposal team clears the way of possible IEDs. In the days ahead, these men will play a deadly game of hide and seek. It is unknown how many IEDs the Taliban have hidden in Marjah. We start moving. The Marines slowly make their way towards their first objective, the Loy Chareh bazaar. There is sporadic Taliban sniper fire. I quickly glance around and see no Marine within my eyesight return fire. Oh well, if they are not too concerned, I won't be either. More sniper fire ... and then ... technical difficulties. My camera starts to go on the fritz! The nightmare of any photojournalist – just as we have the chance to shoot exclusive pictures in perfect light. It's not as though I can put a pause button on what is happening, and say "Wait Marines and Taliban, I need a moment to figure out this problem!" Half of my images disappear into some video deadzone, never to be recovered. I have no publishable words for how I feel about this. We make our way into the main compound of the Loy Chareh bazaar. The fight to rid Marjah of the Taliban begins in earnest. Atia, Gordon, and I are to spend 10 days with the Alpha Company. 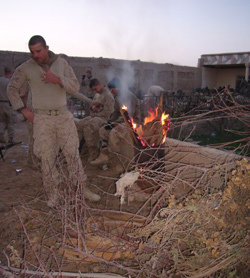 We will see how the Marines engage in battle, how they deal with the local population and the extremely rough living conditions. And perhaps most importantly, how they deal with each other. Thats not nice Mary.... a "War Zone Virgin".... Atias a hard charger whos been to Iraq and almost kidnapped in '05 in Afghan! But anyways, all of you are now honorary "Marjah Marines" in my book (ill get you the coin when we get them) . Great piece. Love our Marines (in oh so many ways). But there are no apostrophes in plurals. The statement "Most of these journalists are heavy hitters, long having earned their PhD's at the university of conflict coverage," would have been much more powerful without the punctuation error. Thank you. My son with 3/6 Lima Company - appreciate your coverage. Would love more pics or video for chance to get glimpse of him. More coverage on news on that there's a war going on and what our sons and daughters are doing. Absolutely loved your handling of the call of "Mother Nature" in the middle of the night. As we all know, when a girl has to go, WE HAVE TO GO!!! You handled it well and honest which means to me, the rest of your story is honest too. Thank you for telling the truth, raw as it is...it is the truth. You have given life to a side of history that we normally would not see or know about. For that, you are a credit to both your profession and being a woman out there in a Marine's world. Thank you very much for the stories. We have a son in Alpha Co. Love to know what he has been up to on his all expenses paid vacation. Great story. We love the Marines. Any pictures of the Marines in 3/6 Lima Company, Marjah? Moms would love to see them. Good stuff CNN!! Why aren't the other news outlets doing this type of important work? Shame on them. Compelling. Capt. Havens is good friend. Thanks so much. Well I should have been a journalist cause this lady sounds like she is having a very real experiance with these Marines. Koodos to her & her collegues who temp fate to bring the rest of us closer to the real side of armed conflict. As an old former Army Infantryman who is now a civilian paramedic in Iraq I can tell you the Marines are a bunch of good guys, no one I would rather fight or fight along side. May GOD Bless & keep us all !!!!!!!!!! thank you Mary, and Atia for your ongoing coverage. My wish was for this coverage to continue so that we at home might have an opportunity to catch a glimpse of our loved ones. It's been a harsh several weeks without good journalism and especially photo coverage. Our best to you. And Mary, you would have made an excellent Marine. I'm happy you had such a memorable experience!! Sounds just like summer camp (exept that people were actually getting killed) I'm sure people of Marja found it memorable too. Although they would probably have traded anything in the world not to be caught in the middle of the battle. Thank you Mary for the coverage, imagine that we did not have the WWW – we almost didn't get to have it – if it weren't for that MIT graduate student that unleashed the whol-e ghost of huemanity. The PENTAGON had no intention of society having access and is why they had it for a decade while building military bases across the globe. I notice that you have military protection; I remember FOX in Iraq and how they video taped the beheading of 4 security soldier/guards with no military protection around them needed and no one ever questioned WHY? Being aGREENable is blossoming like springtime and has such a refreshing scent of huemanity....... Thank you for keeping us informed. Ditto, that, my son also Alpha Company. We thank you for all you and Atia have passed along to us. You're one brave crew, I must say. Heartfelt thanks. keep up the great work,I have daughter at bagram sgt.liza mehian . God bless you in leting Americans informed. Our son is part of A Co. and we truely appreciate being able to read and see what he and his fellow Marines are accomplishing on their mission. Thank you for your story! We look forward to Part II. Semper Fi! Our son is in A Co. also. Thanks for the information!! We look forward to Part II. It does our heart good to hear and see what these fine young men are doing! Semper Fi!! Thank you for sharing, As a parent of a Marine in Marjah 3/6 Lima, we look forward to hearing any news. I have a son in 1/6 Alpha Company. Thanks for the insight into what goes on. Thanks for sharing this with us, enjoyed reading it. Looking forward to Part II..
Great perspective Mary! Thank you so much for this! Who says the mainstrea media refuses to get the story out??? Well Done, Mary! !